In a scene more reminiscent of The Matrix than Master and Commander, Land Rover BAR have launched the third in their series of test boats. The rules only allow the team to build one full-size 50ft America's Cup Class (ACC) boat. However, the team can build shorter (45ft) versions as test boats – T3 is one of these, and while it looks very like the final race boat, it's a few feet shorter. The rules also define much of the hull shape and structure, leaving wing and hydrofoil control systems one of the key technological battlegrounds. Just as wire cable linkages between the accelerator pedal and the carburettor in cars have been replaced by sensors and electronics; aboard T3, the ropes previously used to control the sails have now been replaced by hydraulics and electronics. No one gets this thing off the dock without the password to the computer. And so almost all of the team's innovation and new technology is hidden deep inside this third boat on the long development path to the final design of the race boat for the 35th America's Cup. 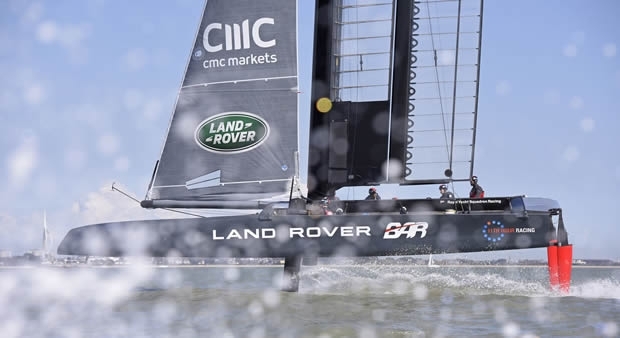 Of his team's new beast, Ben Ainslie Team Principal and Skipper of Land Rover BAR, comments: "T3 is another fantastic piece of technology from our designers, engineers, shore team and key suppliers. It's terrific to see the step changes we have made each time we launch a new boat. This is a new team, but it's growing up fast. Really fast." Richard Hopkirk, Head of Systems and Analysis added: "T3 takes us a significant step closer to the systems that we will use on the final race boat. This boat will allow us to test and develop across all the key areas that will impact our ultimate performance, it's a critical progression in the search for fast, stable and continuous flight."